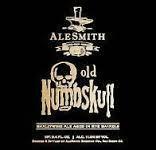 Old Numbskull is AleSmith’s first barley wine offering. You may find the name “Old Numbskull” curious. Barley wine has its origins in England and tradition is to begin the name with “Old”: Old Nick, Old Sampson, Old Jock, etc. Tongue-in-cheek is often the spirit in naming a barley wine. After drinking a glass or two, you may agree that Old Numbskull feels like a fitting description. It also reminds us of the Three Stooges, one of the greatest comedy teams of all time, so it’s meant to bring a smile even before the first taste. Exotic fruit aromas, along with clean ethanol, caramel, honey and toasty notes are present in the nose. At five months of age, the Numbskull flavor begins malty and the hops become more evident from the middle to the finish and linger nicely in the aftertaste. The aroma notes also show themselves in the flavor.